What matters to you that is worth the pain and effort of battle? Today I thank the presence of the ARMY OF ANYONE, former members of Stone Temple Pilots and Filter, whose efforts of self-expression affirmed and reminded me of the worthiness of some important battles. It is only through the effort of battle to overcome complacency and indifference that we can actively learn and make a better world. Sometimes battle is confused to only mean a fight of violence; however, it means so much more, more significantly in the context of which I am referring is the effort against powerful forces and the effort to strive to overcome and achieve something. In the same way, learning is often confused to be limited or associated only with academic education or organized schooling, whereas learning is rather a process of so much more that encompasses all regards of life experience in which one can gain skills and knowledge that affects behavior and outcomes. Would you agree that it is worth a battle in some form to stand up for human rights and freedoms, civil rights, equal protections under the law when such rights are being violated? How about fighting for one's honor, truth, justice, or to right that which is wrong? Would you, a peace-loving hippie, "lover-not-a-fighter", professor/advocate of peace, love or otherwise, involve yourself in battle for anything or anyone? Would you fight to protect who you love, what you love, or the ability to love? And what if the battle is but only within yourself TO LOVE and TO LEARN, to learn what is worth fighting for, to learn human and civil rights, to learn about honor, truth, justice, and the difference between right and wrong, to learn to communicate, express yourself, to be effective, efficient, read, write, calculate, learn to love, share, create, and play. What matters to you that is worth the pain and effort of battle? And in what manner will you aim and make effort to win? Musicians know the pain of such a battle to learn, express and play. The calluses on my fingers from learning and playing guitar are the same calluses that every guitarist, bass player, and pianist is familiar, like the calluses in the palms of every drummer's hands, and the calluses in the wounded hearts and souls of every passionate singer/songwriter. The presence of Army of Anyone, in all their creative self-expression affirms the worthiness of some important battles. 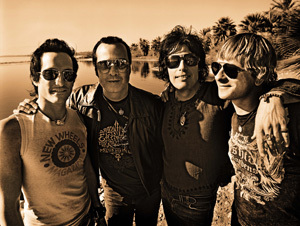 Army of Anyone, a new band comprised of former Stone Temple Pilots guitar and bass mates, Robert DeLeo and Dean DeLeo, with former Filter frontman, Richard Patrick, and their amazing drummer Ray Luzien, is carrying on and playing their new music along with some of their old classics from Filter "Hey Man Nice Shot" and "Take a Picture" (awake on my airplane song), and Stone Temple Pilots "Plush" and "Interstate Love Song" from their '92 original CD Core. 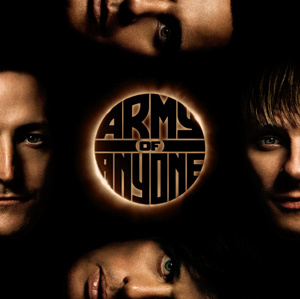 Army of Anyone is bringing out all the freshness of the new millennium empowered by the energy of all their classics from Filter & Stone Temple Pilots strengthened by a new powerful backbone of drum beats from Ray Luzien with hot new songs "It Doesn't Seem To Matter", "Disappear", and "Goodbye". And just when that feeling happens that it doesn't seem to matter, Army of Anyone with the spirit of classic rock n' roll appear loud and clear making it matter, showing that our existence and efforts are very important for eachother, and that where there is love even after goodbye, one is never really gone. They also make it clear through their music, performance and lyrics that there are times when love is not enough, but rather presence and active effort are essential. Hear what they're saying. Listening to Army of Anyone and reading their lyrics; the words and music in their new record express it well. In response to what we can do for efforts to make a better world, Army of Anyone guitarist Dean DeLeo points into his very important note in the CD booklet "LOVE LOVE LOVE. Pass it on" and together with frontman Richard Patrick declares to Rock for Learning the deep and meaningful encouragement to always keep in mind "We are eachother." Who would have ever imagined a peace-loving hippie like me would one day fashion a fancy pair of full on army camouflage pants, dangling straps metal hooks and all. I got mine in Hollywood fom from Hot Topic where music matters. It makes me realize as I do not favor the manner in which the current anti-terrorism war of this century has been so far handled, that I do believe there are battles worth fighting and to not only choose them wisely, but also choose wisely the manner in which to battle. In the same way that I choose my battles wisely, I also choose wisely the music that I enjoy, share, and play. When you choose to take that battle and make that effort through life's complexities, who will stand together with you? Who is there for you, who shows up? Here it's the Army of Anyone, they're here for us with their music and passion. We have the Army of Anyone and we're in this battle to spread the love and pass it on - and in the process to learn, share, and create to make a better world. Do you think we will win this battle? If yes, please join us. Check out Army of Anyone and their new self titled debut record. YOU WILL LOVE IT! ARMY OF ANYONE I LOVE THIS SONG "DISAPPEAR"
as I try to disappear ever knowing "Where there is love you know I'm never really gone." RockforLearning - Learning whatever it takes for a better world. And if you have music and passion, please contact Rock for Learning and see how we can spread the love together.